Software-defined storage (SDS) is making moves to become the dominate storage infrastructure, replacing more traditional architectures. The transfer of features out of storage and into servers running SDS software has been the latest technology shift to pay dividends to those implementing new, open storage options. ATTO Technology Inc. created eCORE Control Engine technology to complement SDS by separating data and control paths, making it possible to add common, open storage services and industry standard API integration. 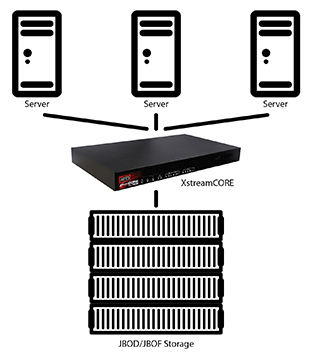 Found exclusively on ATTO’s XstreamCORE storage controllers, eCORE connects off-the-shelf JBOD and JBOF and RAID storage to shared storage networks. Users can connect up to 240 flash devices to multiple servers, leading to a benefit of reducing or eliminating the need for flash inside the server, thus driving down software licensing costs. 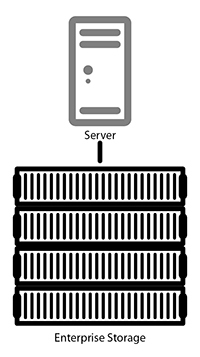 Traditional Storage Architectures provide services and features such as RAID, Deduplication and Snapshots at the enclosure level. This leads to higher expense as these services and features may need to be purchased server times over. Software Degined Storage architectures provide services and features at the server level. This allows one place to maintain feature licensing while using lower cost storage to architect a data center. 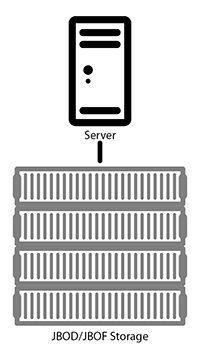 XstreamCORE allows multiple servers running software defined storage to share off the shelf storage at high speed while adding features that accelerate and offload data transfers from host server.